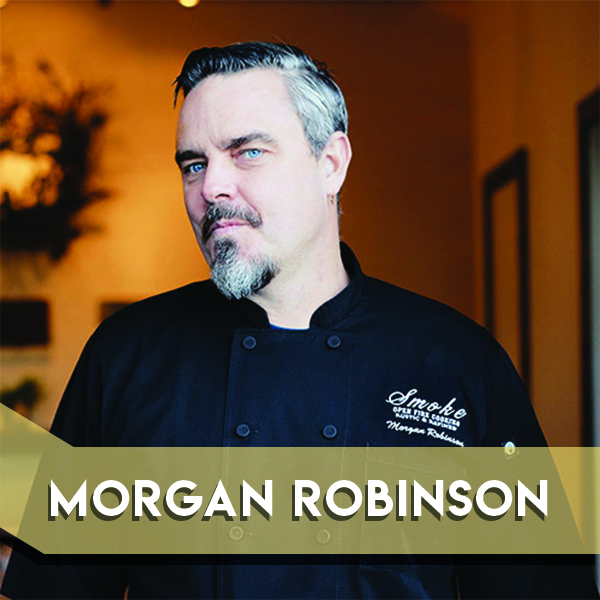 Morgan Robinson has more than 25 years of experience as a classically trained chef in restaurants & wineries such as The Ritz Carlton/Aspen, Bistro Don Giovanni, Domaine Chandon, Cakebread Wine Cellars and Franciscan Estates, among others. Morgan founded SMOKE to follow his passion and vision – a catering company that is inspired by fire – the Mediterranean roots of rotisserie, grilling and other open hearth techniques. Morgan uses local ingredients and artisan food producers, all employing sustainable practices, to prepare his inspiring menu items onsite, creating a truly unique experience for guests. This year SMOKE celebrates 10 years of providing innovative food to the Napa Valley. In 2016, Morgan and his wife, Irma, opened Southside, a community-driven café and coffee bar, serving real California cuisine with a Latin influence, along with specialty coffee from Wrecking Ball Coffee Roasters, and beer & wine from friends in the Napa Valley.